Formula One is often regarded as the “pinnacle of motorsport” because its cars go around racing circuits faster than any other—until Porsche had something to say about it. The German automaker may have stopped competing in the World Endurance Championship (WEC), but that doesn’t mean it no longer intends to have fun with its retired, Le Mans-winning LMP1 car. 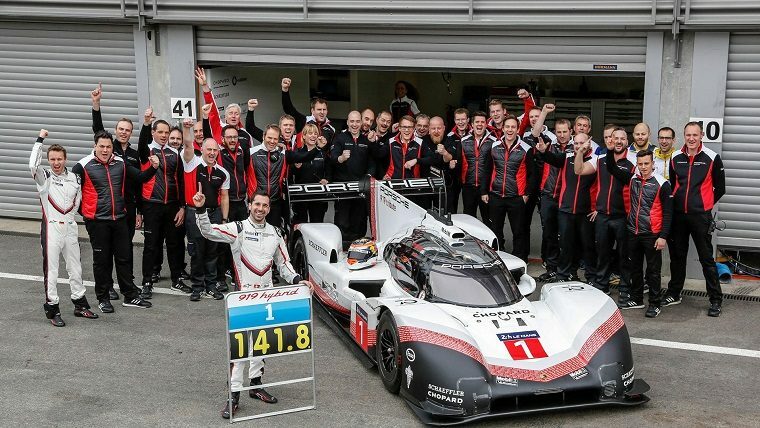 This morning, Porsche and WEC champion Neel Jani took a modified 919 Hybrid “Evo” to the Spa-Francorchamps circuit, home of the famous Eau Rouge corner, and broke the lap record that had been set last year by F1 champion Lewis Hamilton. Jani set a lap time of 1m 47.770s, several tenths quicker than the 1m 42.553s that Hamilton had managed in 2017, and more than 10 seconds quicker than the 1m 53.756s that Jani himself had set in qualifying during the 2017 WEC season. Porsche managed this by freeing the 919 Hybrid of the usual FIA restrictions (thus the “Evo”). The fuel-flow meter that limited it to 500 bhp was removed, allowing the 2.0-liter turbocharged V6 to unleash its full 720 hp, and the electric motor’s output was also increased from 400 to 440 hp. Additionally, a new larger front diffuser and rear wing were installed, featuring “actively controlled drag-reduction” systems similar to DRS in F1. Porsche says the 919 Hybrid Evo produces 53% more downforce than the LMP1-spec car. The manufacturer didn’t stop there: it also added a four-wheel brake-by-wire system; removed the air conditioning, windshield wipers, pneumatic jacks, and several sensors; and equipped stronger suspension wishbones and a new power steering system. It should be noted that while Porsche is making a very big deal of having beaten an F1 record, F1 cars are also restricted by the FIA and could go much faster if the engineers were free to let loose. It’s also not a coincidence that Porsche chose Spa to do this, as it is one of the tracks where the 919 Hybrid can make the best use of its advantages. What’s more, based on the 2018-spec F1 cars’ performances at the Australian and Bahrain Grand Prix, it’s already reasonable to assume Jani’s record will fall when the F1 circus arrives at Spa this year. Then again, bragging rights in the automotive performance sector do tend to be temporary. Still, there’s no denying the impressive technological feat that is the 919 Hybrid, and Spa was just the Evo’s first stop. Porsche intends to take the unleased LMP1 car on a “tribute tour,” though it seems none of the upcoming destinations will involve any record breaking. The car will be seen doing a demo lap at the Nürburgring Norschleife before making appearances at the Goodwood Festival of Speed, the Festival of Porsche in Brands Hatch, and the Porsche Rennsport Reunion in Laguna Seca.